Leaving Maidens beach on a cold January morning Andy, Elizabeth and Bill, headed north under the headland of Barwhin Hill. An easterly breeze made warm winter gear essential. Our morning journey from Glasgow had been under dark, dull grey skies; it was something of a relief to find the forecast sunshine. During the holiday period in Decemebr 2012, the Scottish west coast and western/central Highlands have had very little in the way of blue sky and sunshine. We craved a fix! Amazing the positive mood an 'open' sky brings. Culzean Castle commands a fine position on the cliffs. We went right under the battlements - giving a few visitors something to photograph - titled 'Mad Kayakers' no doubt! Interestingly, at the base of the cliffs, cave and castle passageway openings all had yetts. Crossing Culzean bay was entertaining - It was only 3km - but felt longer. The east wind was funneled off the land, from Maybole direction, and although one kilometer offshore, we could smell the freshly manured fields - 'a fine country smell', said Andy. We reached Dunure at high tide. It's a gem, especially as it has a kayaker friendly pub just yards from the harbour wall. The layout of the village around the harbour makes it feel as if it should be sited on the Aberdeenshire coast. High water gave an easy landing on the small shingle beach. 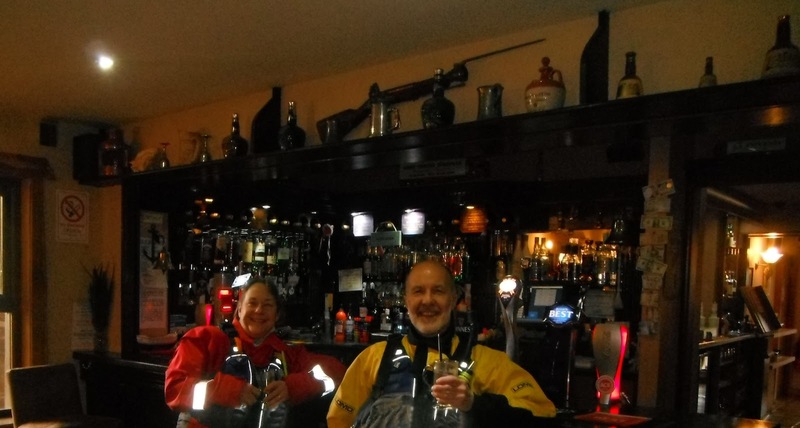 As Elizabeth had forgotten her lunch it seemed a great idea to grab a sandwich in the bar.....Bill and Andy did offer some of their lunch, but the warmth of the bar won! Elizabeth has trouble with zips.